Proper nutrition is a major part of keeping your dog healthy. 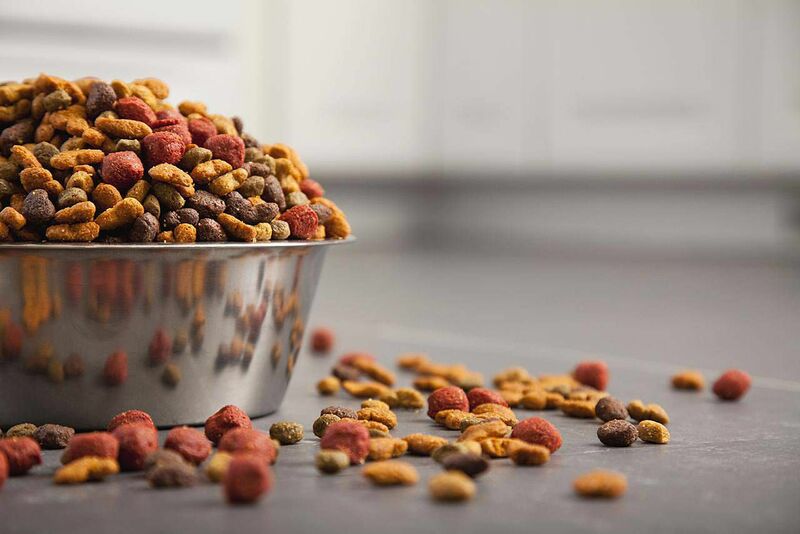 Commercial dog food comes in many forms, but not all can be considered equal. It is important to understand the differences before you choose a food for your dog. Premium dog food companies often use higher quality ingredients than economy or generic dog foods. Some contain fewer chemical preservatives. Premium diets are typically formulated to meet or exceed AAFCO standards. Know that more expensive does not necessarily mean better quality. You still need to do your research and check ingredients. Also, be aware that some companies change formulas from time to time, so your dog might do well on a certain food for a while, then suddenly not as well (depending on your dog). Here are just a few of the premium diets on the market today. Ultra -- a formula with a focus on holistic nutrition. Various products are geared towards age and size. Nutro also produces a variety of treats as well as products for cats. Eukanuba (pronouced "you-can-NEW-bah") was founded in 1969, its name taken from a jazz-era word meaning "supreme." Since then, the company has grown tremendously. Different diets have been developed for all types of dogs based upon life stage, breed size, and level of activity. Eukanuba also offers a line of veterinary prescription diets. Dry kibble, canned foods, dog treats and cat foods are all available. Eukanuba is a Procter & Gamble company. Like Eukanuba, Iams is a Procter & Gamble company. Canned and dry diets are available in a selection of varieties based on age, lifestyle, and size. Veterinary diets are formulated for dogs with special health requirements. Iams also makes a wide variety of dog treats, as well as their unique "Savory Sauces," which can be added to food to increase palatability. Cat foods are also available. Hill's Pet Nutrition dates all the way back to 1939 when Dr. Mark L. Morris Senior, a veterinarian in New Jersey, developed a special diet to help a guide dog in kidney failure. Soon, a partnership with the Hill Packing Company evolved into Hill's Pet Nutrition. Dr. Morris' vision was carried on by his son, Dr. Mark Morris Jr. Since then, the company has grown to provide food for healthy pets with a scientific approach to nutrition, known as Hill's Science Diet. Canned and dry formulas are available for puppies, adult dogs, and seniors. Hill's also has a line of prescription diets. Treats and cat foods are available as well. Hill's Pet Nutrition is owned by the Colgate-Palmolive Company. Royal Canin began in 1967 with research and knowledge-based nutrition in mind. Their scientific focus has led to many nutritional breakthroughs over the years. Today, Royal Canin offers dozens of dry formulas especially geared towards individual dog breeds, ages and sizes. A variety of veterinary prescription diets are available in canned or dry. Cat foods are also produced. Royal Canin is ISO certified to meet international manufacturing standards. Did Your Pet Just Eat Something It's Not Supposed To?